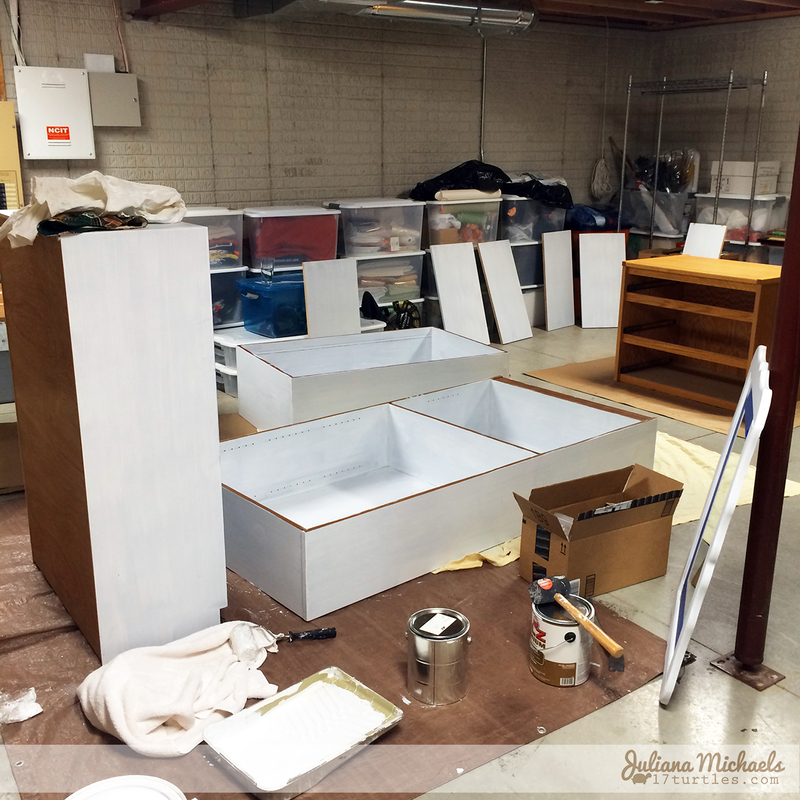 I'm finally doing something that I have been dreaming of doing for years...I'm giving my scrapbook room a makeover! I have always wanted to personalize and decorate my scrapbook room, however, because we have moved so many times over the years, I have always just moved into the space that was available and left it as it was. I have never taken the time to make it my own. I have never hung anything on the walls. I have always just moved my hand me down furniture into place and used it as it was. Now, the time has come! I'm so excited that my dream is finally becoming a reality! I know my space probably looks great to a lot of people, but I have had this dream for years! I have collected some fun storage pieces and containers over the years that I love, but the furniture is what I have really wanted to change. The book shelves are a combination of "permanently borrowed" dorm room furniture, an old kitchen table, and salvage pieces found in the alley on garbage day. I've moved some of these pieces of furniture 6-7 times over the years, and I guess you could say that I'm just tired of looking at them! So a couple of weeks ago, I decided it was time to make this dream a reality. I knew I couldn't afford to buy new furniture, so I decided to paint everything. I settled on a nice white color called Sunday Times. At this moment, I am in the process of painting all 3 book shelves and the chest of drawers this color. 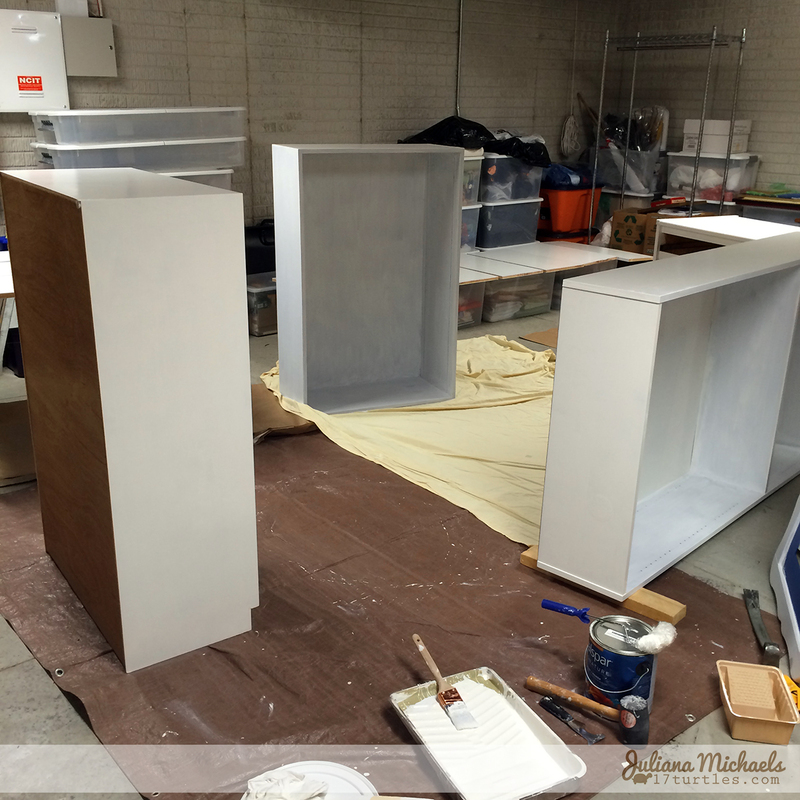 I have one more coat and they will be finished! 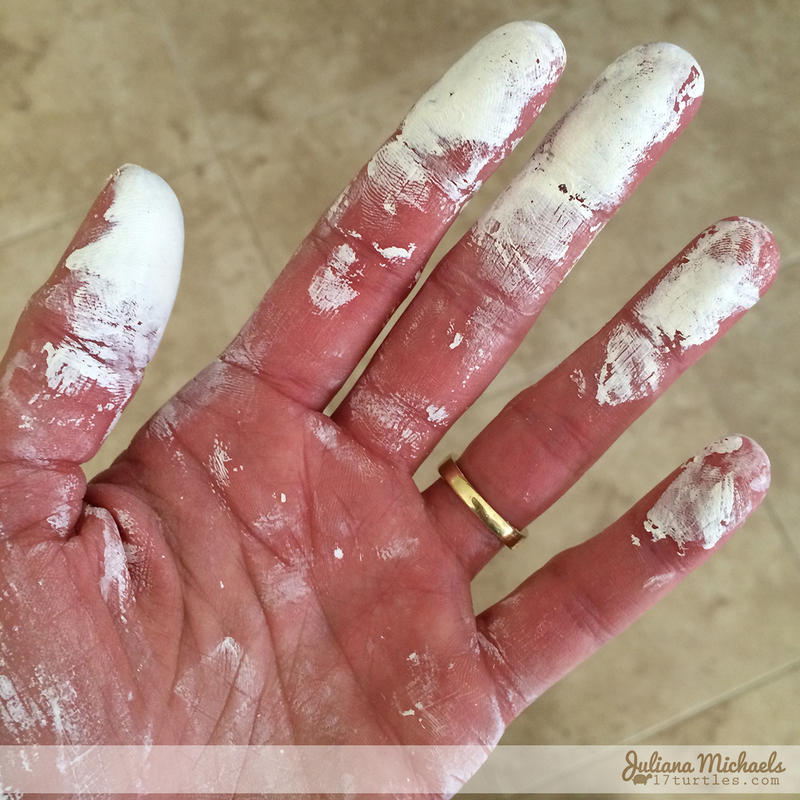 I'm not much of painter and as you can see by my hand, I tend to get a little messy when I paint! I guess I could wear gloves, but that wouldn't be much fun! 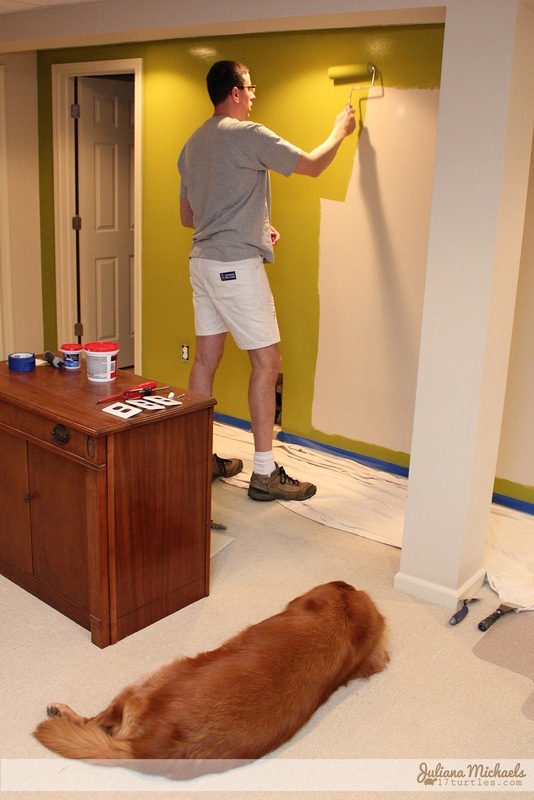 I also decided to paint the wall behind the bookshelves to create an accent wall with a super fun color called Spritz of Lime. 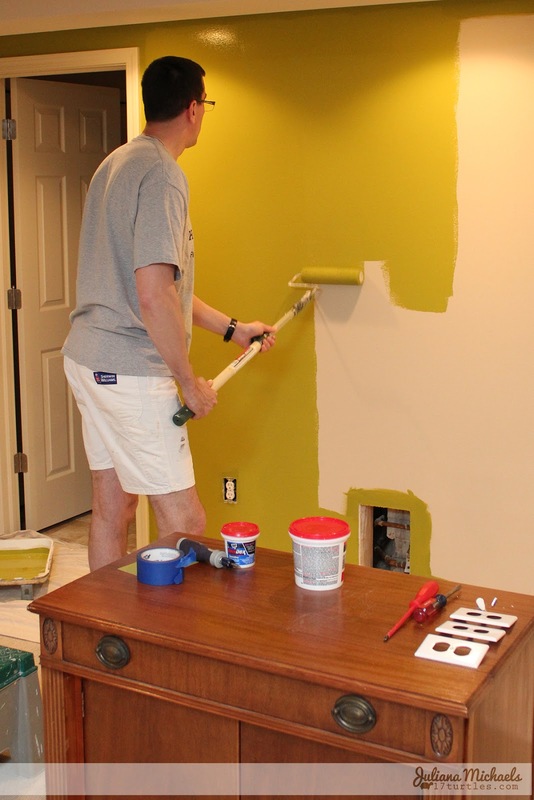 It is an awesome color of green and my husband was sweet enough to paint the wall for me. He has one more coat and it will be complete. If you think my hands were messy from painting the shelves, I can promise you it would have been even worse if I had tried to do the walls! As always, Milo has been supervising the entire process! Once I finish painting the shelves and get things moved back into place I plan to paint my desk and determine whether or not I want to paint any of my storage boxes and containers or get rid of the plastic bins. I'm not really sure about all that yet. I also want to hang some things on the walls and really make it my own creative space! This is just Part 1 of my Scrapbook Room Makeover. I plan to continue to share the process and the final result. If you have any questions or comments about things, please feel free to share or ask in the comment section below or message me on Facebook! I'm excited to see the outcome! I created and decorated my first scrap "studio" about 2.5 years ago. It was so much fun to do, and I love my room! 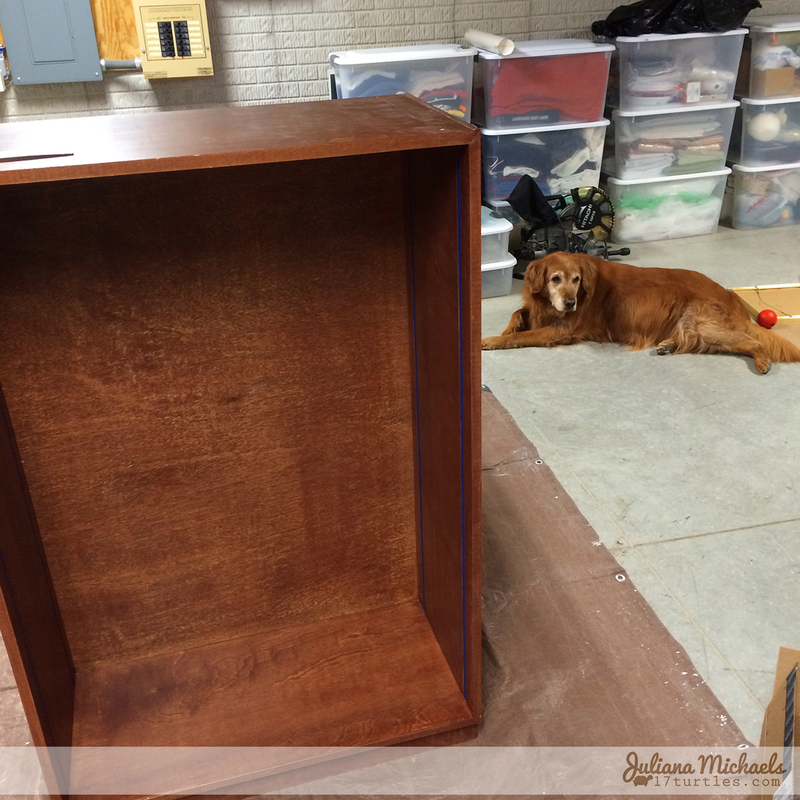 You have got the most patient dog - just love it how he supervises your work! This is going to be a fabulous room - looking forward to seeing the final result. 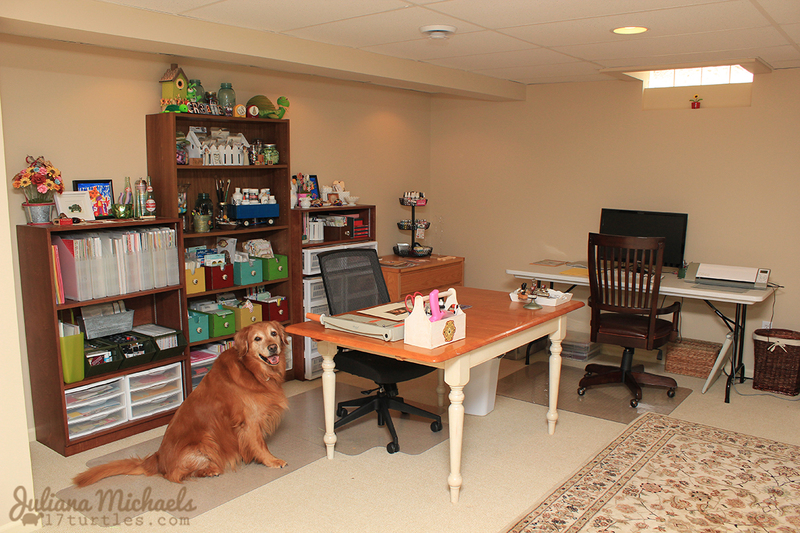 Can't wait to see the finished craft room. Looks like you are getting lots of help. Congrats.. I loved when I finally got to just paint my room last june. It isn't complete but the colour makes me happy. Look forward to seeing what you do. I can't wait to see what you are going to do. I love the colour. I was finally able to paint my room last June (DH went away for a weekend and I just did it). The room isn't complete yet but I love what I have so far. Good for you!!! I so know what you mean, I had the same feeling as we moved into our new house a little over a year ago, I just really wanted my scrapbook room to be what I wanted it to be. Thanks to my super sweet hubby, that's what I finally got. He even helped me hang up all my little things on the walls because I'm never good at that measuring thing haha. With you table I know you are going to paint it but have you ever thought of taking some photos and things and doing them with that clear coat on the top? I have always wanted to do a table like that and have been thinking about finding an old accent table or something that I could try it with. My brother did it for a couple tables he has in his basement and they turned out wonderful. Well good luck to you and enjoy!!! Very anxious to see your finished space!! !